The overall amount donated to charity by Australians grew by 2.6% in the year to February 2013 with health causes pulling hardest at donors heartstrings, according to the National Australia Bank’s Charitable Giving Index. Charity sectors attracting more of the donor dollar in the past 12 months are in Health and Disability (up 10.5%), Medical Research & Services (up 7.9%) and Cancer (up 5.7%). Humanitarian organisations are still attracting more than 30% of total donations, despite a 6.2% fall in donations over the past year. NAB Group Chief Economist Alan Oster says, while there is overall growth in giving, it is slowing compared to previous years. “The overall level of donations is growing above inflation but is down from the rapid growth level of 8.3% growth in 2012. “The slow-down is in line with the broader economic environment. We have seen lower levels of business and consumer confidence in the past year while economic conditions and consumption have been weaker so it is no surprise that the overall growth rate of donations has slowed. “There also appears to have been a shift amongst consumers towards spending on services such as travel, health and entertainment and this may have come at the expense of other types of discretionary spending, including donations to charity. “During the past year we have experienced fewer major global natural disasters which may have contributed to a shift away from humanitarian causes,” Oster said. In South Australia, residents in postcode 5081 (covering suburbs including Vale Park and Gilberton) were the most generous donating an average of $248 per person or 0.27% of their income to charity. On the measure of total donations, this made residents in 5081 the most generous in Australia ahead of postcode 2071 (Killara) $198 and 2030 (Vaucluse) $195, both in NSW. Nationally, residents in postcode 3909 (including suburbs Kalimna and Lakes Entrance) in Victoria and 2912 (Gungahlin) in the ACT were the most generous relative to their income, both donating 0.30 per cent of their income to charity. 5081 in SA was one of only three postcodes, including 2912 and 2602 in the ACT, which were in the top 10 for both total donations and donations as a percentage of income. NAB General Manager Corporate Responsibility Paula Benson said the index provides key insights into the donating habits and preferences of the nation. The index shows that the two peak periods each year for donations are in June prior to the end of the financial year and in November, driven by the strength of the campaigns such as Movember. 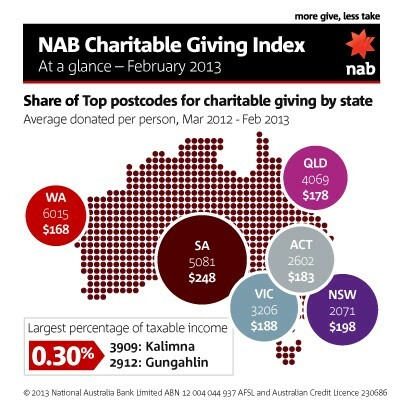 The NAB Charitable Giving Index is a twice-yearly index which was launched in October last year. The Charity Index Data is produced by Quantium and includes donations via credit card, direct debit, BPAY and EFTPOS. Direct transfers into charity bank accounts are not captured (e.g. bequests and cheque donations may not be captured). Nearly 600 charity brands are included in the NAB analysis.